This last week I led a professional development session titled “CS Concepts in Elementary Grades” for my district’s Tech Expo. It was one of several dozen sessions available for teachers during the day. I had just a handful of teachers at my session. I started with this video from Code.org. It introduces “why CS?” better than I can. Next, we took a quick look at the CS Standards at http://www.csteachers.org/page/standards, just to see that there are standards and where to find them. Then I let them try out the Virtual Pet project using the Scratch cards from https://scratch.mit.edu/tips. I picked the Virtual Pet project as it hits all the concepts I wanted to introduce. I had one Kindergarten teacher attend my session, so I handed her an iPad with Scratch Jr. on it. She had a great time playing and exploring Scratch Jr. while the rest of us working on our Virtual Pets. The Virtual Pet project turned out to be pretty complicated for a first time Scratcher. They had a hard time with Broadcast and Recieve, just like my Code Club members when they tried the Virtual Pet project. I guess I knew this would be a difficult concept but it is so powerful. I like all the things you learn when trying this project out, even if it is a bit overwhelming. After some success, we moved on and I showed them some student work. I wanted them to see examples of how to incorporate Scratch into their curriculum. Using Scratch to show your math solution. I have many more, but as we were running out of time I quickly went through some Debug-It projects I found on the Scratch site. I think it is important that teachers feel confident in helping students when they get stuck. Knowing how to debug Scratch projects can help. I didn’t really pick the right Debug it projects for my attendees. These were more challenging for my audience than I thought they would be. I wish I had chosen easier ones or left this for another session altogether. I hope my session left them with an idea of how to start using Scratch in their classroom. I also hope they will reach out to me if they would like support facilitating Scratch projects in their classroom. I worry that they were a bit overwhelmed with all I presented. They were a pretty quiet bunch, but I guess I’m used to a room full of rambunctious 10-year olds. Today was going to be the start of another round of Code Club for 4th graders but school was cancelled due to icy roads. I have 18 students signed up for this session, my 5th. For some students this will be their second round of Code Club and I will call them my “experts”. The rest are new to Code Club and may have little experience with Scratch, or none at all. I started last year’s Spring session with the maze game with good results. That will be my plan for this session’s first meeting which will be next week now. In the mean time, I’ve been looking at some new resources to get ideas for new projects. (I love the projects from Code Club World but it’s good to have variety.) I found a project in the book Super Scratch Programming Adventure! from No Starch Press that I would like to try with my Code Club coders. It’s the Space Odyssey game and the second project in the book. The book is nicely laid out and kid friendly with parts of it in comic book mode and downloadable resources. It even has an educator/parent guide. I’ve spent the morning following the directions for Space Odyssey project and I think my students will like it. It has all the elements that they are known to enjoy: cool graphics and sounds, step by step directions, customizability, and game play. Last week’s Code Club took a lot of planning and preparation. I’m going to write about it in 2 parts. Here’s part 1. I introduced one last project for Code Club on Wednesday. I wanted them to learn that Sprites can sense what they are touching, like a color, or the stage’s edge, or another Sprite. Collision detection is a fairly basic element in many computer games and not trivial to code for in many programming languages, in my opinion. Scratch makes it fairly intuitive. 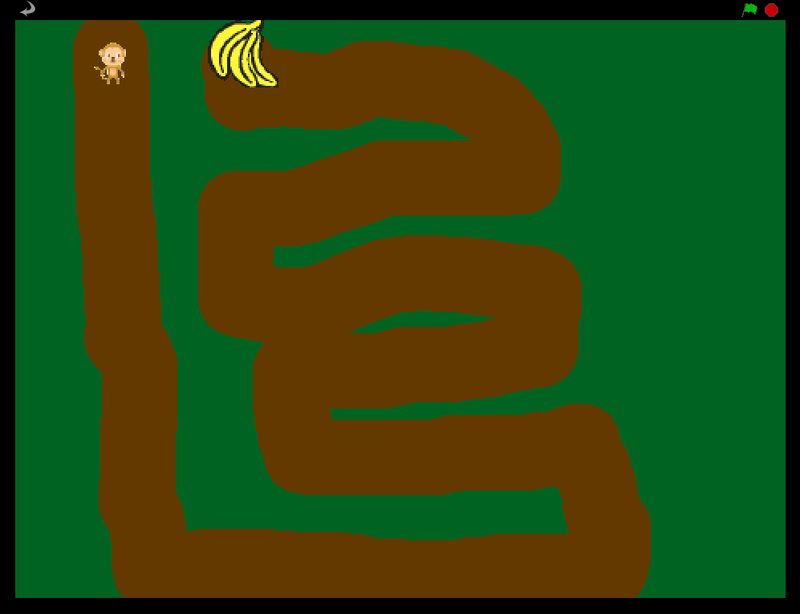 I found three different instructional resources that teach the creation of a maze or race game in Scratch. Code Club World has a Boat Race project in beta form. It is so new, in fact, that when I went looking for a project of this type, it was only available from Code Club (for UK clubs only). Looks like a fun project and I want to try it next time. In Jeremy Scott’s “Starting from Scratch” guide, there’s a maze game that introduces collision detection. I like this resource from the Royal Society of Edinburgh. It explains basic computer science concepts and ideas that the students will be exposed to using Scratch. That helps me use the correct terminology and know the “why” do I teach this behind the “how” do I teach this. The maze game instructions looked easy to follow to me, but it wasn’t in the Code Club format that the students had grown used to. 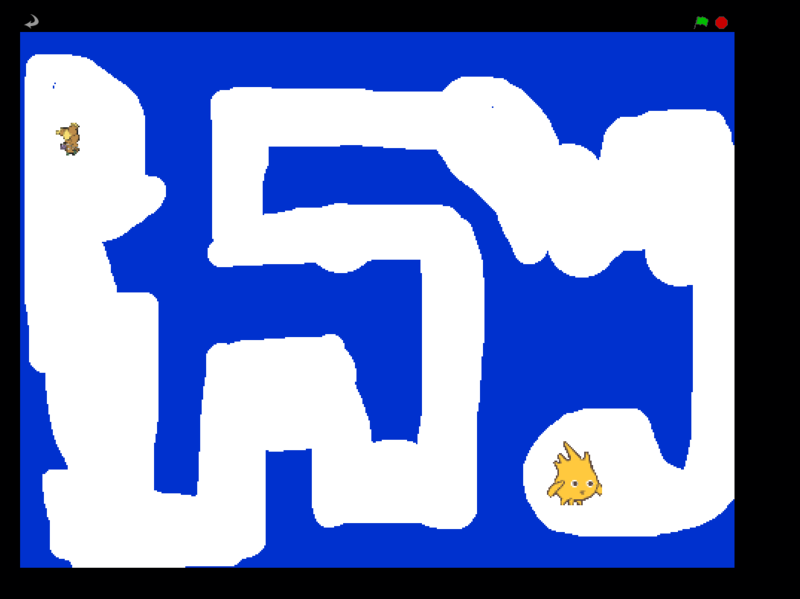 Maze game -use the arrow keys to reach the dragon. Don’t touch the sides. 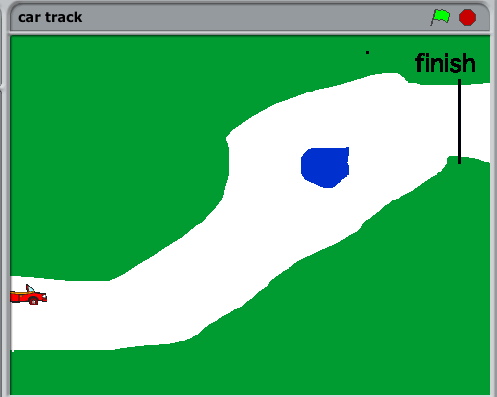 I also came across Simon Haughton’s website and in his second Scratch lesson he has a car racing game. The goal is to cross the finish line without driving off the track. Driving off the track sends you back to the beginning. I like how he has the students make their own race track in 3 simple steps: Flood the stage with color, draw or erase the “track”, and draw a finish line in a different color. I used his instructions first with a group of 4th grade students who have been learning a bit about Scratch during school. We didn’t have time to do any extensions, like adding a timer, enemies or sounds, but a couple of students added a “crashed” costume to their car. Turns out if the new costume is bigger or a different shape than your original, you may be touching the edge of the track even when sent back to the start. Another student was starting to add an oil slick, like my water hazard, before we ran out of time. Unsure of how much coding time we’d have in Code Club this week, because we had a guest speaker coming talk about software development, I decided to started with Jeremy Scott’s Maze game instructions. 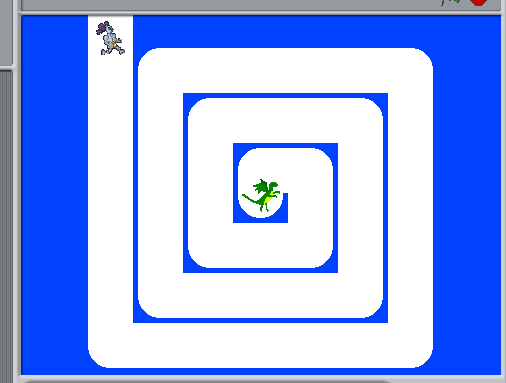 We used the maze gif resource for the stage but I let them choose any two sprites for explorer and target. One student spent the whole time editing the sprite to his satisfaction -a graphic designer in the making, perhaps? Next we set up the arrow key controls on the explorer sprite and added collision and target detection. By the end of Code Club some were able to start a second level of their own design. The jump to using different sources for instruction was hardest on my volunteers. Our speaker stayed to assist and I had my high school student there as well. I had experience fielding questions with this after my 4th grade class earlier that day, but my volunteers were grasping the concepts at the same time as the students. Also the handouts weren’t as readable as they could’ve been. After a rough start, things settled down and the students seemed pretty independent. Hey, I think that’s success right there. What about that guest speaker, you ask? That’ll be part 2.